After the holiday craziness dies down, I need to relax. I have officially been stuffing my face since Thanksgiving, spending money, stressing out, and I need a major break. This made me think... What are you doing in your business to help? Because I know I am not the only one feeling this way! I have some quick ideas for whatever business or services you do! Keyword being DETOX. Black Baltic Body Mud - Cleanse + Detoxify + Balance + Moisturize / 168 oz. 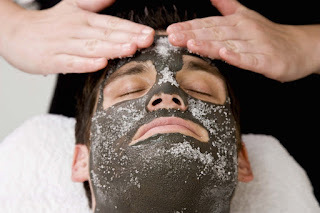 Promotes detoxification, extract pore clogging impurities and improve skin texture, with this black creme mud. Organic silts are collected from deep underneath 30,000-year-old fresh water lakes in Eastern Europe. This refreshing treatment mask provides an intense, tingling sensation while it deeply cleanses pores. In addition to ginger and witch hazel extracts, it contains hyaluronic acid to help reduce the appearance of fine lines and wrinkles. Single use mask. For aging, mature skin. White sheet infused with light brown essence. Only the finest 100% pure, cold-pressed oils of almond, grapeseed, and sunflower are used in these plant therapy massage oils. They can also be mixed with sea salts for a customized body scrub. This stimulating blend contains juniper berry, cypress, lavender, and rosemary. This oil has 1% essential oils. Norvell Intensive Detoxifying Salt Scrub / 10.5 oz. Reveal your most touchable skin with Norvell’s Intensive Detoxifying Salt Scrub! Coarse grains of salt deliver a deep scrubbing sensation that sloughs off rough, dry skin from shoulders to heels.